Hollywood - I've owned this kickstarted game for a fair while now. I actually bought it off gumtree and didn't back or even know about the kickstarter campaign, but when I bought it about two years ago it was still in brand new condition. Everything was punched, but all the cards etc were still in order and it was clear Hollywood had never been played. That's the way its remained, sat on the shelf amongst my pile of shame, its second owner in its almost four year life and still no one was willing to play it. I'm not sure what it's lack of appeal was or why it had been relegated to the bottom of the pile, but this week I finally decided I would give it some love before I moved it onto a new owner. That was until we played it and realized it's actually a decent game! Not amazing, but picture a simpler version of 7 Wonders, with a movie theme that works and makes sense and you'll have a general idea of how this game plays. With Oscars, high profile stars, producers and big box office hits - Hollywood actually has an excellent foundation for an enjoyable game, albeit with a few shortcomings with a couple of the rules. With the use of real stars, directors and film studios, Hollywood could have a lot of mass appeal. As it stands today it'll never be a favourite but I'm looking forward to introducing it to some new players and play counts. Expect to see some more on this game shortly. Welcome To The Dungeon - Inspired by enjoying the above game off the pile of unplayed games, I decided to try another. Welcome To The Dungeon hasn't been in the library for too long, but it didn't look to be played any time too soon. Our first try was just with two players and while we got a feel for the game, it was just OK. I'd expect play count had a lot to do with this, so again will return to the dungeon when I have 3 or 4 players to try it with. I like the artwork, small box, easy rules and bluffing/sneaky elements of the dungeon so am sure it won't be too hard to bring this out again shortly to see if the fuss was worth the hype. Fugitive - I didn't get a chance to continue playing through the different 2 player games in the library, but I did get to sneak in a couple games of Fugitive with another new player. I escaped as the fugitive but lost as the marshall with one hideout to go. I should have guessed two on the last turn but decided it was a bit too risky. In hindsight I would have won, but that's what makes the game more enjoyable! Might be easier playing as the fugitive? Really need to add the events in and see how it changes things. T.I.M.E. 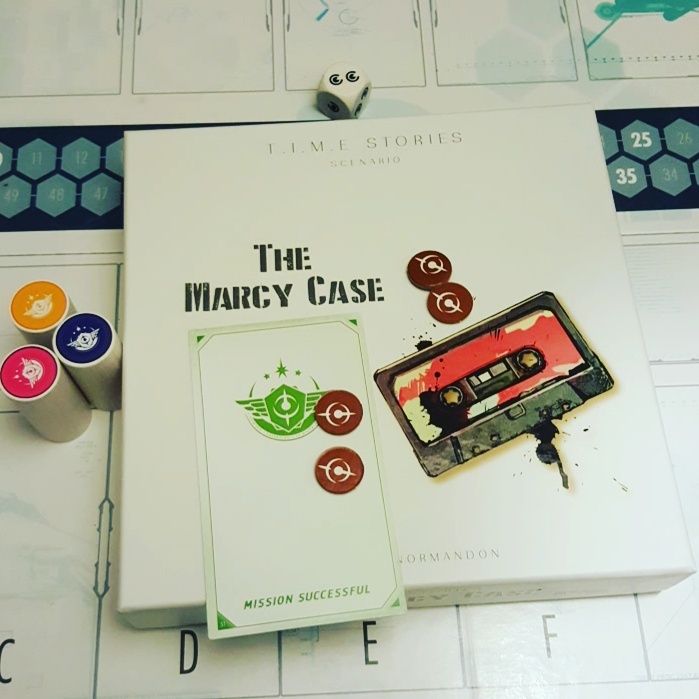 Stories: The Marcy Case - We've endeavoured to have weekly sessions of Time Stories, because we've enjoyed getting into the stories and also because it helps when you can remember what you've learnt each run. For various reasons this hasn't really worked out and its often been 2-3 weeks before we've been able to sit down for the next run and by this time minor but important details have always been forgotten. We were pretty sure this has been costing us and angering Bob, so we decided for the first time to try back to back sessions. Mission accomplished. It was our 3rd run through which seems to be fairly standard, but on the third play we managed to do everything with plenty of time to spare. I'm not convinced this was the best way to enjoy the game as it did feel pretty rushed, but getting a winning result and solving Marcy's Case was still exciting nonetheless! We've agreed to a short purposeful break before discovering the Prophecy of Dragons where I hope we can commit to our weekly sessions a little better! Still Going Strong - Two previously unplayed games finally got some attention, completed another Time Stories Scenario and I didn't buy any new games. As I've mentioned things could be like this for a little while to come still..